Stairways, Inc.’s all wood spiral stairs will add warmth to any room. Libraries, entryways, living areas...wood will add a warm and traditional feel. With Stairways, Inc.’s all wood spiral stairs, the standard and most economical species of wood is Red Oak. Other species of wood typically used include Ash, Maple, Walnut, Hickory, Mahogany, White Oak, Teak, Ipe, Cypress, Pine, Pecan and Mesquite. When designing your all wood spiral stair, match or contrast the wood species to the walls and/or floors. On an all wood spiral stair the center column is 12 sided but, full round columns are also available. Baluster options are shown on the “Component Parts” page on our web site or can be seen on page 15 in Stairways, Inc.’s brochure. 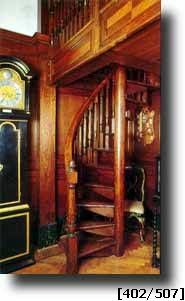 Baluster choices will have the greatest design effect on an all wood spiral stair. Handrail options are also seen on the “Component Parts” page on our web site and page 14 in Stairways, Inc.’s brochure. Handrail shape and size will also affect the appearance. Talk to one of the Stairways, Inc. sales team for help with a size proportionate rail for your design.